Homemade brioche dough baked and decorated as colorful Easter bunnies - fun at an Easter brunch. Melt butter and allow to cool. Break up the yeast and dissolve in the tepid milk. Put the flour, sugar, 4 eggs, salt and the melted butter into a bowl and pour in the milk with the dissolved yeast. Using a food processor with a dough hook, knead the ingredients together to a smooth dough for about 5 minutes. Cover and leave in a warm place until the dough has doubled in size. Knead the dough again on a surface dusted with flour. To make the bunny, make 6 larger tennis-ball sized rounds for the body and 6 smaller rounds for the head. Make ears and arms out of the rest of the dough. Assemble the bunnies on a baking tray lined with baking parchment. 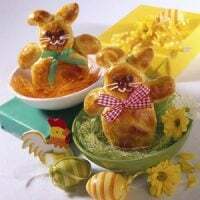 Mix the egg yolk with the cream and brush the surface of the bunnies with the mixture using a pastry brush. Bake in a preheated oven at 350 degrees F for 30 minutes. To make the glaze, mix together the confectioners' sugar with a little water and fill a plastic sandwich or freezer bag with the mixture. Cut a corner off the end of the bag. Squeeze out the glaze to glue raisins as eyes and noses and to pipe whiskers on the bunny.